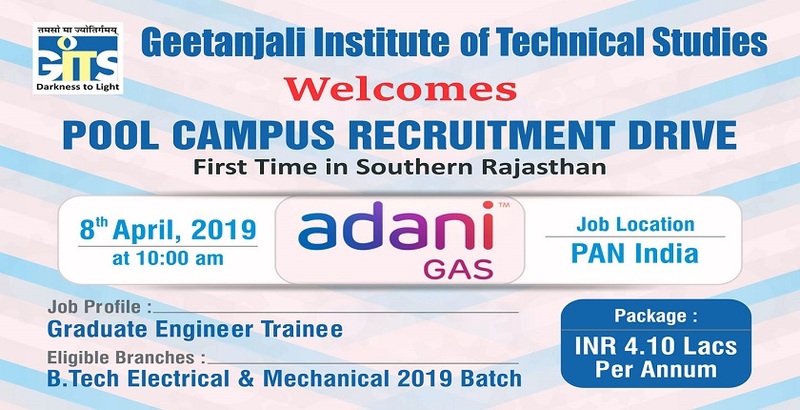 GITS > News > Placement > POOL CAMPUS DRIVE OF ADANI GAS LTD. POOL CAMPUS DRIVE OF ADANI GAS LTD.
First Time in Southern Rajasthan GITS is organizing the Pool Campus Drive of Adani Gas Ltd. for B. Tech Mechanical & Electrical Students (2019 Batch) for profile of Gradate Engineer Trainee at Package of INR 4.10 LPA on 8th April 2019 at 10 am. Since our inception in 1988, the #Adani Group has grown exponentially. Over the last 25 years, the Group has established itself as a leading infrastructure conglomerate from India and put together an integrated value chain that is unique and in many ways unparalleled anywhere in the world. AdaniGas is developing City Gas Distribution (CGD) Networks to supply the Piped Natural Gas (PNG) to the Industrial, Commercial, Domestic (residential) and Compressed Natural Gas (CNG) to the transport sector. Natural Gas is a convenient, reliable and environment friendly fuel that allows consumers to enjoy a high level of safety, convenience and economic efficiency. The company has already set up city gas distribution networks in Ahmedabad and Vadodara in Gujarat, Faridabad in Haryana and Khurja in Uttar Pradesh. In addition, the development of Allahabad, Chandigarh, Ernakulam, Panipat, Daman, Dharwad, and Udhamsingh Nagar gas distribution is awarded to consortium of Adani Gas Ltd and Indian Oil Corporation Ltd.
2) The candidates who have given the GATE exam are only eligible to apply. 3) To apply for this job, you need NOT be GATE Qualified. You should have written GATE 2018 examination. CAMPUS DRIVE OF COLLABERA SERVICE PVT. LTD.